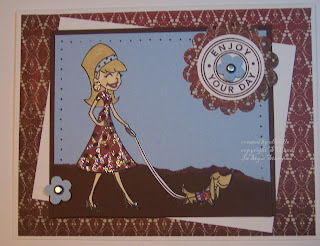 InStyle stamps thru a card contest. This one is called Pam and Buster. It was so much fun to work with. One of their design team members did the paper piecing technique and since I have never tried that before I couldn't wait to try it too. I paper pieced Pam's dress as well as Buster's outfit. Here is a great tutorial on paper piecing that I found on Cambria Turnbow's blog. I added stickles to the clothes. Paper PIERCING around the blue sky. To finish the card off, I adhered the sentiment on a scallop circle punchout, added the two little flowers with silver brads and adhered it to the white card base. Very cute. Love the paper piecing. This is so pretty...love that image! Fab job and tfs! !